I'm rolling on a birthday theme this week! This card is a great way to explore the new Sweet Pea Paper Stack in the Occasions Mini. There are soooo many choices in the stack and many color combinations. You won't have a problem creating with this handy stack. If you NEED to order this Sweet Pea Paper Stack (or any Stampin' Up! 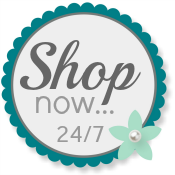 products) please use my Website to order 24/7. I love how you dotted the label! Very cool! Wonderful paper selection, Patti! I just got this paper this week - this inspires me to crack it open and cut it up! That first cut is always the hardest :) This is very cute! Super cute! I love that stack... possibilities are absolutely endless! I love this layout and the colors are so different and fun! How did you manage to get those dots on the sentiment so even . . . at first I thought they were paper pierced. It's a marker, right?